Furious campaign groups across the UK have rejected the government’s proposed ‘pay to protest’ measures, warning they will not hire private companies to facilitate anti-government rallies. Their announcement on Thursday came shortly after Scotland Yard told protest groups it will no longer monitor traffic adjacent to protest sites in Britain. The force had previously carried out this role for decades. The Metropolitan Police said campaign groups organizing demonstrations will now have to pay for related traffic management, including road closures, stewards and barriers. But campaign groups strongly rejected the suggested policy shift. In a joint statement, groups said the ‘pay to protest’ measures were an assault on fundamental rights. Among those who refused to accept Scotland Yard’s demands are the People’s Assembly Against Austerity, Friends of the Earth, Defend the Right to Protest, Stand Up To Racism, CND, Unite Against Fascism, the Campaign Against Climate Change, Million Women Rise, the Palestine Solidarity Campaign and Stop the War. Vice-chair of Stop the War Chris Nineham said protest is vital to any robust democracy and must be preserved. “Before the historic 2 million person march against the Iraq war in 2003, the police told us we couldn’t go to Hyde Park because we would damage the grass,” he said. He stressed political campaigners must continue to resist attempts to restrict Britain’s culture of protest. Trade Union Congress (TUC) chief Frances O’Grady echoed Nineham’s stance. O’Grady praised the Met’s efforts in assisting with some of Britain’s largest demonstrations in recent years. She said protest organizers should provide adequate stewarding for their demonstrations, but argued traffic management is not something they should have to deal with. O’Grady said the TUC understands Scotland Yard faces serious pressure as a result of slashed police budgets. But she warned placing traffic management costs on the shoulders of political campaigners is wrong. CND General Secretary Kate Hudson stressed creeping privatization in Britain counters the public interest. “To arrive at a situation where well-funded campaigns can afford to protest and the poor cannot would be against everything that our society stands for. We absolutely oppose any attempt to charge people to protest,” she said. Million Women Rise, which seeks to end male aggression and violence towards women and girls, is planning to hold a demonstration on March 7. Organizers of the protest said last week that police had informed them they will have to hire a private security company and create a road closure plan in preparation for the rally. Scotland Yard claims protest organizers will not be made responsible for policing costs. The force is “refusing to use the public purse to provide a traffic management plan or stewarding for a private event,” a spokesperson for the force told the Guardian. 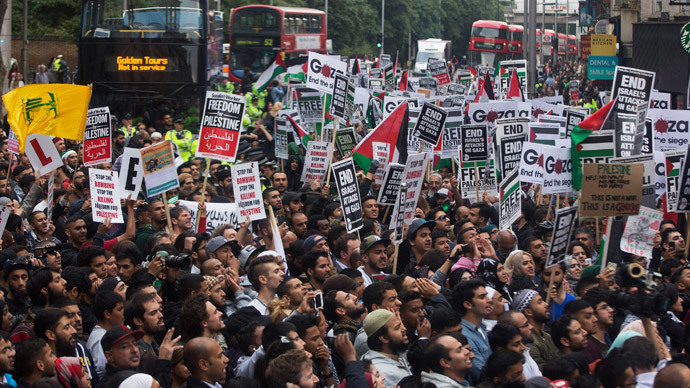 In a public statement released last week, Westminster council argued its position on public demonstrations remains unchanged. “We fully recognize the democratic right to protest and organizers have not been subjected to any new council requirements, restrictions or fees,” it said. Nevertheless, concerns regarding the privatization of protest are mounting in Britain. Campaigners have launched a petition opposing what they describe as an attack on the right to protest on Avaaz.org. It has gathered almost 60,500 signatures to date.